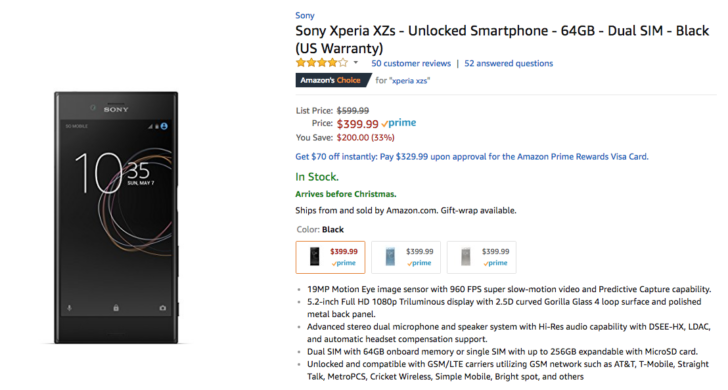 Sony Xperia XZs is now available for purchase at $399.99 which is $200 less than its list price. Sony Xperia XZs was launched in US during April 2017 and it is powered by Snapdragon 820 processor. Sony Xperia XZs is one of the best smartphones to shot slow-motion videos, it can shoot 960fps video. Here only Amazon is offering discount for the smartphone. Xperia XZ smartphone is available in Black, Ice Blue, and Warm Silver colours.